Mexico City: debunked. (a.k.a CDMX - Ciudad de Mexico; a.k.a Mexico City DF - Distrito Federal). Unfairly burdened by the stereotypes of Western media as a crime-filled megalopolis, one truly will find those tropes to be laughable after a first-hand experience in the heart of Mexico. What you will find is that the most populous city in North America (second-largest in the Western Hemisphere) is actually a world-class city that actually nurtures some of the most creative minds in the world. 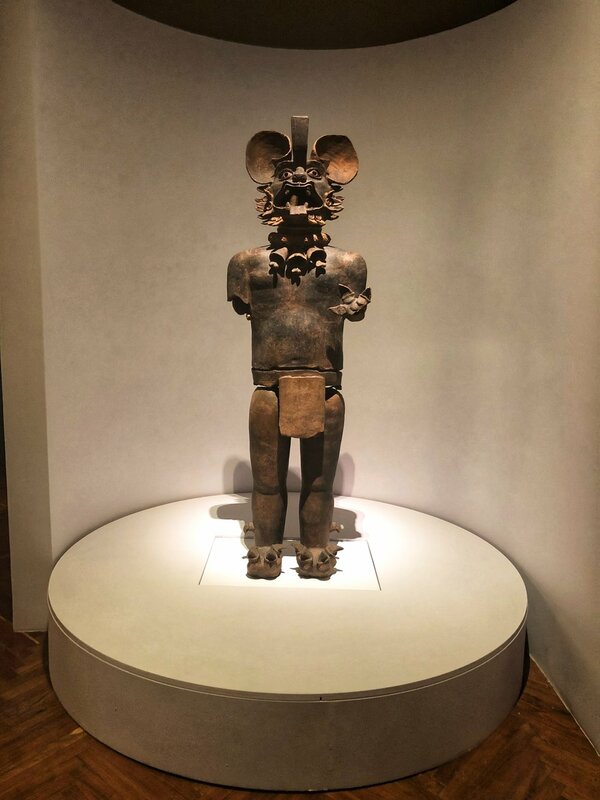 You can go on a true food and art bender here as the city is blessed with architectural, artistic, and culinary geniuses influenced by the cultural traditions and tapestries of Latin America, Europe, and, of course, all of its rich history from its pre-Columbian era. While tourism to the city is increasing, it is still relatively "under-the-radar"; it was what Iceland was 10 years ago. Yes the city has a few unsafe areas and some heavy traffic, but it is no different than New York City or Atlanta in that regard. We found the neighborhoods we explored to be safe and used Uber liberally. Given the false narrative that follows Mexico City, it is often eschewed by travelers for other locales in Mexico. But as much as the swanky resorts and crystal blue waters of Cancun, Tulum, and Los Cabos beckon your wanderlust, a walk through the wide avenues and green spaces of Mexico City will not only give you an unforgettable metropolitan experience in a world class city at an affordable price (compared to its contemporaries), it will shatter your preconceived notions of the city and the country itself. As a bonus, if you are an American traveler, it would be a short flight from much of the continental US without a significant time change. We would recommend at least 3 full days in Mexico City on your maiden voyage (let’s be real, once you come here you probably will want to come back in the future). For reference, we spent 3.5 days as a family trip with our parents. 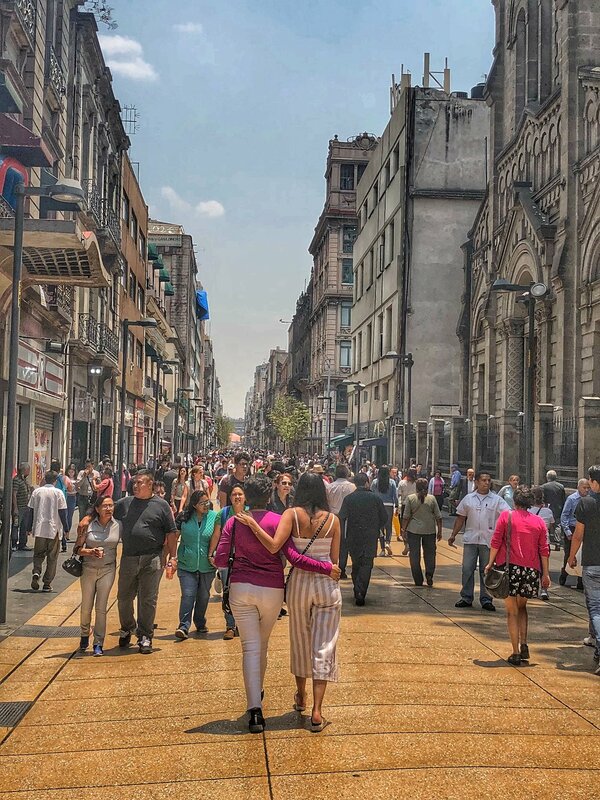 While the city can be explored in any particular order based on your interests, we will continue our Mexico City itinerary series with a day exploring the Centro Historico (Historical Downtown) of Mexico City and an evening in the “we got next” neighborhood of Roma Norte. This day is a must do; it serves as the ultimate juxtaposition of Mexico City’s steeped-in-history draws colliding with its innovative and hip future. Yes, Mexico City is having a moment now. But it is without doubt that we believe Mexico City will be a travel destination heavyweight in the coming years. We are sure some day our path will lead us to a return visit to this amazing city for even more adventures (and of course fabulous eating). But as we close out our current Mexico City series, we hope our travel musings help you plan your own trip to CDMX. We chose to stay at an AirBnB in Mexico City as they are extremely well-priced and place you right in the middle of the action. For the first-timer to Mexico City, we recommend staying in Condesa, Polanco, or Roma Norte/Roma Sur. There are many more great areas you can chose to stay in, but the neighborhood-y feel of Condesa and Roma as well as the innumerable hotel options and proximity to attractions of Polanco made them our top 3 choices. In the end we chose an AirBnB in Condesa. GENERAL TIP - if you are staying in the southern or western neighborhoods (such as Condesa or Polanco), traffic into Centro Historico can be a bear so please account for that in your planning. UBER DROP OFF TIP - Use Hilton Mexico City Reforma as a drop off point to begin your self-guided walking tour through the Centro Historico. Use the below map as a general guide. A Mexico City must, the building will catch your eye with its ombre yellow-orange-red dome. Inside it serves as a performing arts center and houses important murals by Diego Rivera and David Alfaro Siquieros as well as other important Mexican artwork. While we did not catch a performance here, we really enjoyed the artwork collection, the ode to Mexican muralism, as well as the building’s architectural itself from its renaissance exterior to its art deco interior. This will always be the perfect Instagram spot. 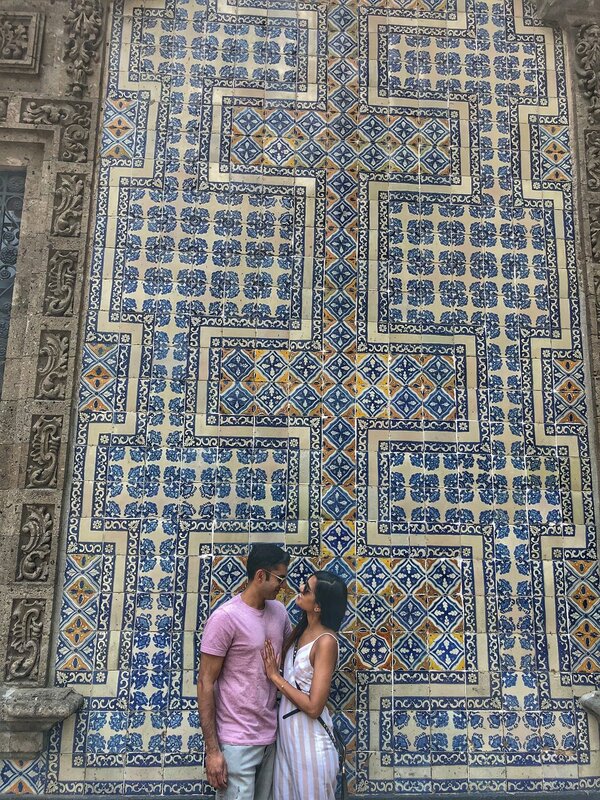 A short walk from the Palacio de Bellas Artes, the Casa de los Azulejos (a.k.a “House of Tiles”) is an 18th century palace adorned by blue and white tiles along its facade. While it serves as a modern day restaurant, we did not partake in the food. 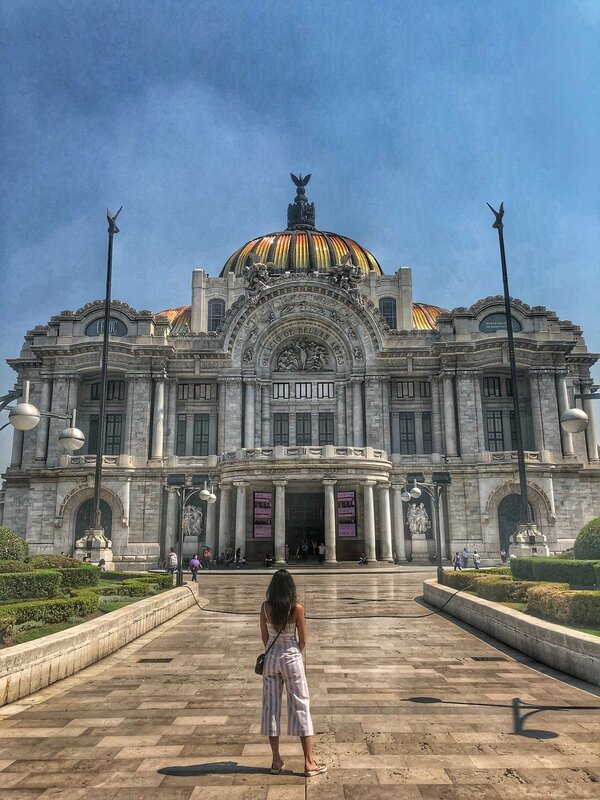 If you are walking from the Palacio de Bellas Artes to Zocalo Square, this is the perfect quick pit stop to admire the gorgeous tile, snap some memories, and continue on your historic adventures. On your first sojourn to Mexico City, it would be blasphemous to not walk through Zocalo Square. It is less about doing something here; instead it is about walking through a spot that has stood the test of time in its cultural significance. It has been a gathering place for Mexicans since the pre-Columbian era. On these hallowed grounds was the Aztec epicenter of Tenochtitlan. Since those days, it has always been an important gathering point for independence day celebrations, visiting dignitaries and foreign heads of state, a main venue for national celebration, and even for cheering the national futbol team. In fact, in the 2018 World Cup, the boisterous and patriotic Mexican fans cheered so hard at Zocalo Square during their upset victory over Germany that they supposedly registered a small earthquake. https://www.reuters.com/article/us-soccer-worldcup-ger-mex-mexico/mexicans-jubilant-over-world-cup-win-trigger-earthquake-sensors-idUSKBN1JD125. There is a huge flag in the center of the square and here you can see the heart of a modern bustling metropolis against the backdrop of gorgeous, historically significant architecture flanking the square. After walking through the square, you can explore a lot of the adjoining areas. We chose to go to the Metropolitan Cathedral. Our last daylight stop was the indomitable Metropolitan Cathedral. 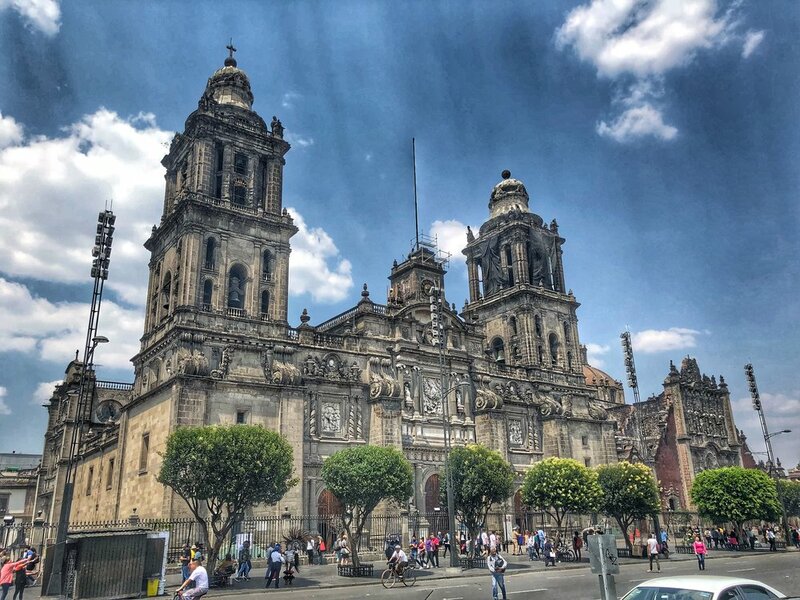 Taking almost 3 centuries to build, the Cathedral has withstood earthquakes and fire to continue to majestically overlook Zocalo Square. The attention to detail of its external Gothic architecture is rivaled by its internal relics, artwork, and significant Gold decor that would make Midas himself blush. The place is remarkable for the peace and quiet it gives you just a few feet away from the hustle-and-bustle of Zocalo Square. It is a place deep in the national consciousness of Mexico and definitely worthy of a visit in Centro Historico. A well-decorated food hall with something for everyone. While it is definitely more expensive than street food, it is a great place to try different kinds of food and grab a beer. There is a young, hip and trendy vibe to the place and it is definitely a spot that is frequented by people from all over the world. If you are looking for something truly authentic and old-school Mexican, this is not it. But if you are looking to sample a bunch of different types of food for your group and just have a chill non-restaurant-y night in the Roma neighborhood, this is a fun food hall. We would give it 4 stars out of 5. A phenomenal cocktail bar. In fact, it is considered one of the best cocktail bars in the world. With great mixologists blending local ingredients with innovative takes, the place lives up to the hype. If you are a fan of a good cocktail, make sure to venture to this Roma establishment.